Satisfy your inner culture vulture at Rock Church and Katajanokka. 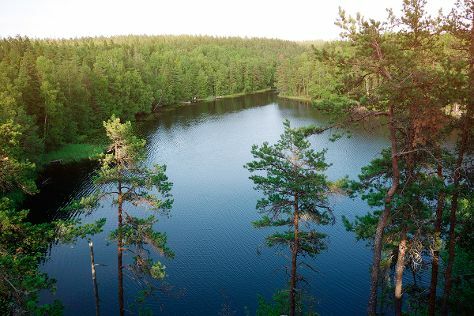 Step out of the city life by going to Nuuksio National Park and Arboretum Mustila. Explore the numerous day-trip ideas around Helsinki: Teijo national park (in Pernio), Tuusulanjarvi (Lake Tuusula) (in Tuusula) and Jarvenpaan Taidemuseo (in Jarvenpaa). Spend the 12th (Mon) exploring nature at Sipoonkorven Kansallispuisto. Next up on the itinerary: brush up on your military savvy at Sea Fortress Suomenlinna, take an in-depth tour of Seurasaari Island and Open-Air Museum, wander the streets of Ullanlinna, and take in the spiritual surroundings of Uspenskin Cathedral (Uspenskin Katedraali). To see photos, traveler tips, reviews, and more tourist information, read our Helsinki route planner . If you are flying in from Italy, the closest major airport is Helsinki Vantaa Airport. August in Helsinki sees daily highs of 24°C and lows of 13°C at night. Wrap up your sightseeing on the 13th (Tue) to allow time to travel back home.